Food storage requires a method of keeping food clean and safe for consumption. Refrigerators and freezers can keep food fresh longer by maintaining the right temperatures so the food won't rot or spoil. To do this, a refrigerator's temperature should range between 37 and 40 degrees Fahrenheit, and a freezer should maintain a temperature from zero to five degrees Fahrenheit. Refrigerators are manufactured as top-mount freezer, bottom-mount freezer, and side-by-side conventional models, or as built-in units. Another newer option is a modular refrigerator. These are usually configured as easy-access drawers which fit under a countertop, each containing its own temperature controls — a great option for islands or bars. 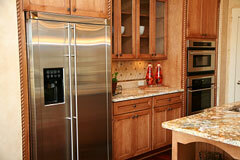 Refrigerators range in size from about 8 to 30 cubic feet. Start with 12 cubic feet for a two-person household, expanding two cubic feet for each additional family member, and an additional two cubic feet if you entertain frequently. Many manufacturers are making refrigerators 24 inches deep to fit into a run of cabinetry. Refrigerator widths vary, with just under 36 inches being the most common width. 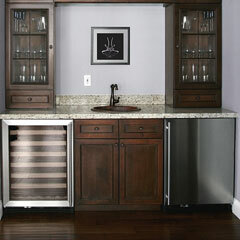 Trim kits and custom panels enable refrigerators to co-ordinate with cabinet styles. Other optional refrigerator features include water filters, through-the-door ice and water dispensers, see-through bins and drawers, sliding shelves, and on-the-door storage. Some models even offer a fast-fill dispenser for filling stockpots or coffeepots with the filtered water. Choose an energy efficient refrigerator, and care for it so it will last for its 15 to 20 year life expectancy. Always plug your refrigerator into a grounded outlet. Keep it about three-quarters full so it will run efficiently at a lower cost. Wipe up spills daily, cover or package foods properly, and discard food that is spoiled or old. Clean the outside surfaces weekly, and seasonally, give the refrigerator a thorough cleaning. Turn off the power and clean the bottom grill, coils, and any other parts that are dirty and dusty. Clean the drip pan if you have one. Keep a box of baking soda handy to deodorize the inside. Freezers are used for long-term storage. Most freezers, except for large, stand-alone chest freezers, are frost free and never need defrosting. Store food in containers or wraps designed for the freezer, and write the freezing date on the item. Your freezer will stay cleaner if you store only clean packages. Check foods every month for expiration dates, and throw out anything past its prime. When your freezer needs cleaning, turn off the power and place food in a cooler. Wash the freezer and bins with a baking soda solution or cleaner recommended in your use and care manual. Dry the freezer with a towel, turn it on, and replace the food. If you entertain frequently, you might want to consider a built-in ice maker, a wine cooler, or even an under counter freezer. These are frequently installed under the counter in a bar area. The U.S. federal government's Energy Star website describes how the use of Energy Star refrigerators and freezers can reduce energy costs. The American Council for an Energy-Efficient Economy (ACEEE) discusses what to look for when selecting a new refrigerator and offers a series of tips for energy-efficient food refrigeration. If you are looking for professional grade food preservation and cooling appliances, you may wish to consider Sub-Zero. They are a leading manufacturer of built-in refrigerators, freezers, and wine storage units.